These girls make me more than happy every day. The question comes often. I’ve learned to expect it. I don’t believe we’ll ever stop being asked it and that’s okay. But, I want to throw this answer out there for all future inquiries. What is the question I’m talking about? Simple. I can honestly say that my answer is no. Yes, there was a time that I hoped I’d have a son. Most men will tell you that they would love to have a son. I was one of them for quite some time. Who was I going to pass my useless knowledge of sports on to? Who was I going to teach to throw a football, play baseball, and do all the silly and stupid things I’ve learned and done throughout my life? I’ll tell you who. 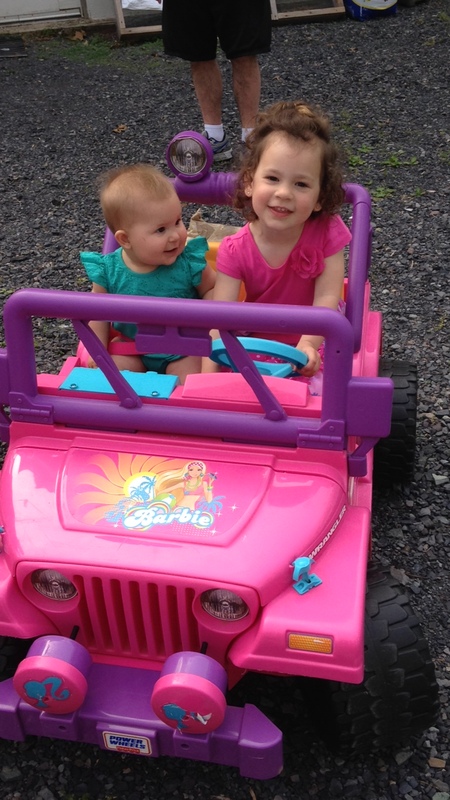 Sophia and Maddie.Yes, it’s true, I did say–on video–prior to having Sophia that I don’t make girls. And we can see that clearly is not the case. Before I became a dad, I had no idea what to expect with kids–boy or girl. I didn’t know what kind of father I would be, nor did I know if I’d be any good at this whole parenting thing. Hell, I still don’t know if I’m any good at it. What is funny to me, and I said this within a week of Sophia’s birth, is I can’t picture having a son now. Not at all. When you have two little girls who are absolutely amazing, laugh at everything, love you and their mom unconditionally, and are happy to do anything and any time, you find yourself to be thrilled and lucky to call yourself their dad or their mom. I’m not going to lie and say that I’ve never thought about what it would be like to have a son, to have boys nights with, to teach how to shave, and all that stuff. But, no, I DO NOT need to have a son. And if we decide that we are finished having kids, which very well might be the case, I’m not going to look back on my life as a parent with any regrets over the lack of a son. You know what I get to do with my daughters? I get to play LEGO with them. I get to teach them to kick a ball, throw a ball, catch a ball, swing a bat, and swing a hockey stick. I get to learn how to do their hair. I get to teach them to ride a bike. I get to teach them how to draw, how to write, how to love, how to be friendly, how to make friends, how to laugh at anything and everything, how to be considerate, what to look for in a friend, how to grow, how to learn, how they can be anything they want to be. I get to be there for them when someone breaks their heart. I get to be there for them to celebrate every little accomplishment. When they graduate high school, when they graduate college, when they land their first job. And one day, lord-willing, I get to walk them down the aisle at their weddings. I get to give them away to whomever they choose to marry. I get to have a dance with them. Girls or boys, it doesn’t matter. We parent, we teach, we learn, we love. I’m a father of daughters and for me and my life–that is perfect.